In my blog post yesterday, I introduced my three part series on the cross by saying that the cross being Christianity’s chief symbol is an enigma. This is because Christianity is a religion of love, joy and peace, while the cross is a symbol of cruelty, sadness and death. Why did our spiritual forefathers, then, take this symbol and make it our chief symbol? In yesterday’s blog post, we tried to imagine a cross-less Christianity and it was a total disaster. We need the cross! In this second post, we move on to see the cross as God’s final vindication. We often think of the death of Jesus Christ on the cross in terms of what that did for those of us who believe in him. We know that it is only in “Christ and him crucified” that we have the forgiveness of sin. And that is true! However, the ultimate triumph of the cross is not so much the fact that it will get us to heaven but rather the fact that it will bring glory to God. This is what makes the cross shine with the brilliance of the noon day sun. It sets forth God as God! This is what the apostle Paul handles in Romans 3:25-26 when he writes concerning the death of Christ on the cross and says, “This was to show God's righteousness, because in his divine forbearance he had passed over former sins. It was to show his righteousness at the present time, so that he might be just and the justifier of the one who has faith in Jesus” (ESV). What Paul is saying in Romans 3:25-26 is that before Christ died on the cross, the character of God was held in question. Why? Because “he had left the sins committed beforehand unpunished.” While this paid glowing tribute to God’s forbearance, it put a big question mark on his justice. It resulted in an apparent split personality in God because he is both loving and holy, and both gracious and just. 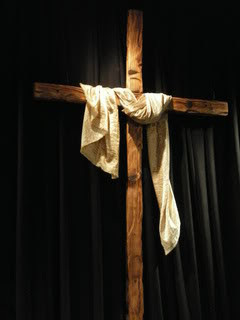 Yet, up to this time when Jesus Christ was crucified on the cross it looked as if God had been compromising his holiness and justice for the sake of his love and grace. Is this really the kind of God who sits on the throne of the universe? Imagine the sinners that have trooped into heaven. Think of Moses with his bad temper, David who was both an adulterer and a murderer, Solomon who was led astray by marrying so many strange women, and the list goes on. All these are in heaven, despite their glaring sins. Surely you cannot say that the blood of bulls and goats wiped away their sins, can you? You try that with your law courts once they find you guilty of a crime that warrants your imprisonment. Offer an animal to be imprisoned—or even killed—in your place. That will be an insult to your entire judicial system. God was not indifferent to the questions his grace and mercy towards sinners were raising about his integrity. How was he to solve it? What Paul is saying in Romans 3:25-26 is that the cross of Christ is the answer. Calvary proves the justice of God. Or to borrow Paul’s words, “It was to show his righteousness at the present time”. Now that Calvary has occurred, God’s justice cannot be questioned any more. How? Let me proceed to answer this all-important question. If there was ever a time when God should have compromised his justice it was when his own Son, Jesus Christ, who was utterly holy and blameless, took on himself our liability. Death is the wages of sin (Romans 6:23). We die because we are born sinners and we grow up sinning. Yet that could never be said of Jesus of Nazareth. He was born sinless (Luke 1:35). Jesus also lived a totally sinless life. Again and again during the public ministry when Jesus had lived about thirty years on earth, God said of him, “This is my beloved Son, with whom I am well pleased” (Matthew 3:17, 17:5). The thrice-holy God was pleased with his life! Even prior to his being betrayed and sentenced to die, Jesus could look his accusers in the face and say, “You are of your father the devil and your will is to do your father’s desires.... Which one of you convicts me of sin?” (John 8:44-46). They were all silent because they knew of no sin that they could charge him with. He was totally sinless and yet he paid the wages of sin. The answer is found in the words of Paul in 2 Corinthians 5:21: “For our sake [God] made him to be sin who knew no sin”. This was the perfect test that would have made God change his mind about punishing sin. Here was God’s own innocent Son being identified with sins he did not commit. Shouldn’t God bend his justice a little and let his Son go free? He did not! Since true justice is blind, the moment God’s own Son was identified with our sin God did not hesitate to bring upon him suffering, shame, sorrow, desertion and even death. The Bible says, “He who did not spare his own Son but gave him up for us all” (Romans 8:32, ESV). Can anything prove more than this that God must punish sin? Here is the darling of God, who himself had never ever sinned. Yet, when he is identified with sin, the Father takes his sword of justice out of its sheath and plunges it into the side of his only begotten and beloved Son. All heaven must be silenced as the Son of God expires in death. All silent murmuring is stilled, and God is worshipped as the truly just One. But what Paul is saying in Romans 3:25-26 is that Calvary not only proves the justice of God but it also displays his wisdom. He says, “so that he might be just and the justifier of the one who has faith in Jesus.” The question across history was: How could God remain just and at the same time declare sinners innocent? Humanly speaking, that is impossible. How could God remain just and at the same time declare sinners innocent? The answer is found in the cross of Christ. Calvary displayed God’s infinite wisdom to the angels in heaven and to humanity on earth because on it God managed the impossible. He was just and at the same time he could justify sinners. On Calvary, “love and faithfulness meet together; righteousness and peace kiss each other” (Psalm 85:10). This was done when God provided a substitute in the person of his Son, Jesus Christ. As we noted earlier from 2 Corinthians 5:21, “For our sake he made him to be sin who knew no sin, so that in him we might become the righteousness of God.” Christ’s death on the cross was a substitutionary atonement! The value of the death of the Son of God was sufficient to redeem a million worlds – if that were necessary. We “are justified by his grace as a gift, through the redemption that is in Christ Jesus, whom God put forward as a propitiation by his blood, to be received by faith” (Romans 3:24-25). The word propitiation refers to a sacrifice made to turn aside wrath. That is what Jesus did on the cross. Thus his wrath and justice were satisfied completely, while at the same time, any sinner who comes to God on the basis of this finished work of Christ on the cross will not only be pardoned but will also be declared righteous for all eternity. No wonder Paul cried, “Oh, the depth of the riches and wisdom and knowledge of God! How unsearchable are his judgments and how inscrutable his ways! ‘For who has known the mind of the Lord, or who has been his counsellor?’ ‘Or who has given a gift to him that he might be repaid?’ For from him and through him and to him are all things. To him be glory forever. Amen” (Romans 11:33-36)! Thank you for sharing this scripture with us.Would you kindly help me to understand the issue with God's justice in relation to His having "identified sin on His Son who knew no sin"?How would we best explain this without again putting God's justice into question?Thank you. In Zambia Your Arrival Is Your Departure!